Since the latest release of TMS Cloud Pack, there is now also built-in support to use Google Firebase for cloud data storage. The architecture of Google's Firebase is quite simple. It offers storage of JSON data in the cloud. The JSON data has a unique identifier in a table and via access with this unique identifier, this JSON data can be read, updated or deleted. In addition, indexing rules can be set to perform query on the data in a Firebase table, for example, retrieve all JSON objects where a field X has value Y. 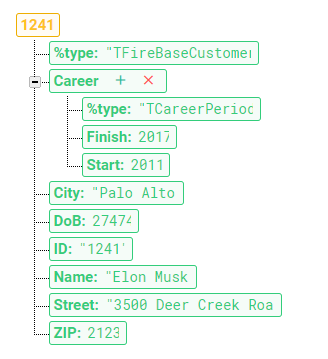 To make it really easy use to use data on Google Firebase from a Delphi or C++Builder application, we have added capabilities to put objects or generic lists of objects in a Firebase table. This is done via the non-visual component TFirebaseObjectDatabase that you can put on the form. Note that we have explicitly set the unique ID of the object via the cst.ID property. When the ID is set at application level, it is the responsibility of the app to use unique IDs. 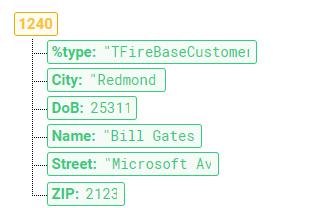 When no ID is set, the AdvFirebaseObjectDatabase will automatically create a GUID as ID. As you can see, more complex classes can be easily & automatically persisted in the Google Firebase cloud. This performs a query on the List table for value 'Bart' set in the 'Name' field. The result of the query is a generic list (in case multiple matching results are found). This was a glimpse at the TAdvFirebaseObjectDataBase component as an introduction for the new Google Firebase access features in the TMS Cloud Pack. Explore the full set of powerful capabilities of TAdvFirebaseObjectDataBase and the many other components in TMS Cloud Pack to make consuming cloud services in Delphi & C++Builder a piece of cake. This blog post has received 7 comments. One of Firebase''s key strength is real time syncing of data. Is that supported ? At this moment we have focused on CRUD operation on objects. The notification part isn''t via standard HTTP REST and at this moment not yet in the TMS Cloud Pack. Is possible use this for work with Firebase Analytics. now that Google analytics is no avaliable for analyticd Apps? Separate from our Google Firebase data access you can use analytics. In our component(s) itself, there is at this moment no integration with Firebase analytics, only Google analytics itself. Excellent News..Thank you...Awaiting updates on this providing access to full capability of firebase from Delphi. I take it you can store components in the cloud? For example, primitive compound shapes? You could indeed persist components, it can be streamed as object to Firebase.